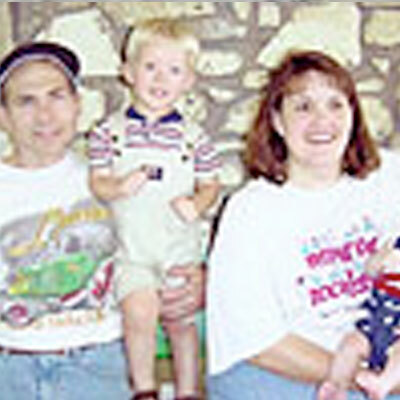 On June 15th, 2003, (Father’s Day), thirty-three year old Kristy Shultz, who lives in Charles City, IA, with her husband, Mark, had their second son, Dylan, who was joining brother Nathan, age two, after a birth that was seemingly without complication. Dylan was born rather quickly, in two hours, compared to Nathan’s birth which took about thirteen grueling hours. However, the following day, Kristy started to develop “flu-like” symptoms, including nausea, and she became short of breath and felt as though she was having anxiety or panic attacks on the 16th of June. By June 18th, Kristy’s shortness of breath continued to increase, her blood pressure dropped and her heart rate soared. Kristy was transferred to ICU. After much discussion with the doctors, radiologists, and specialists, Kristy had exploratory laparoscopic surgery, which revealed a Strep A infection had started in her left ovary. They removed it along with her left tube and appendix. Kristy was also started on dialysis due to kidney failure, and an increase of fluid retention. Kristy required a ventilator to help her breathe, and was put in a drug induced coma so as not to fight the same machines that were helping her to survive. On June 19th, the doctors thought that Kristy might have had a heart attack from a reading from the heart monitor so a swan was put in her neck to monitor her heart more closely. By the weekend, Kristy’s condition did not improve, and her family, especially at the urging of her youngest sister who is a nurse, had her transferred (airlifted) to Methodist Hospital/Mayo Clinic in Rochester, MN. Her family said that she was so difficult to recognize due to all the fluid that she was retaining and her eyes were so puffy that they did not close. At Mayo, Kristy was placed on continuous dialysis while in ICU and received a blood transfusion. She spent eight days on the ventilator at Mayo. On July 1st, 2003, about two weeks later, Kristy was moved to a regular floor, as her condition improved and she was able to sit up in the chair. The following day, Kristy began some PT and stood for the first time in more than 2 weeks, and this only last a few seconds since there was not much strength left in her legs and arms. Then after spending about 3 days on the regular floor, Kristy suddenly was taken back to ICU, because she became short of breath again and coded. They doctors believe this was because she aspirated on something. Therefore, on July 5th, Kristy was again placed back on the vent, given heparin to prevent blood clots, had a number of tests for the clots and her heart. At night, pressure support was increased to help her sleep better so she would not have to work so hard to breath. Kristy spent another seven days in ICU. She had fluid on her lungs and had to work to get the fluid out. Kristy spent a total of six weeks and two days in the hospital for the entire process of birth/strep A/Sepsis/ARDS. She spent the last week in rehab to help her get more strength back and get back on her feet. During this time, when her oxygen levels were low, Kristy had many bizarre dreams and thoughts, but the best one out it all was that she saw her dad, her husband’s dad and one of her grandmothers, who have all passed away, and they sent her back to be with her family. Kristy had about seven weeks of outpatient rehab. She has suffered the problem of hair loss afterwards. It began about two months after getting home. She has spots that are really thin now and prior to getting sick, her hair was very thick. Her son has had no effects from the strep A/sepsis, but they has a tough time finding the proper formula for him. He also had acid reflex which requires that he take Zantac, but overall, Kristy says that he is a very active baby who is already rolling both ways for about a month now. Kristy’s family brought her son to the hospital once she was alert, but it was not the same as the when she had her first son; it took some additional time for Kristy to bond with him do to her extreme illness, but Kristy considers herself extremely lucky to have all of the support of her family in caring for herself and her children.